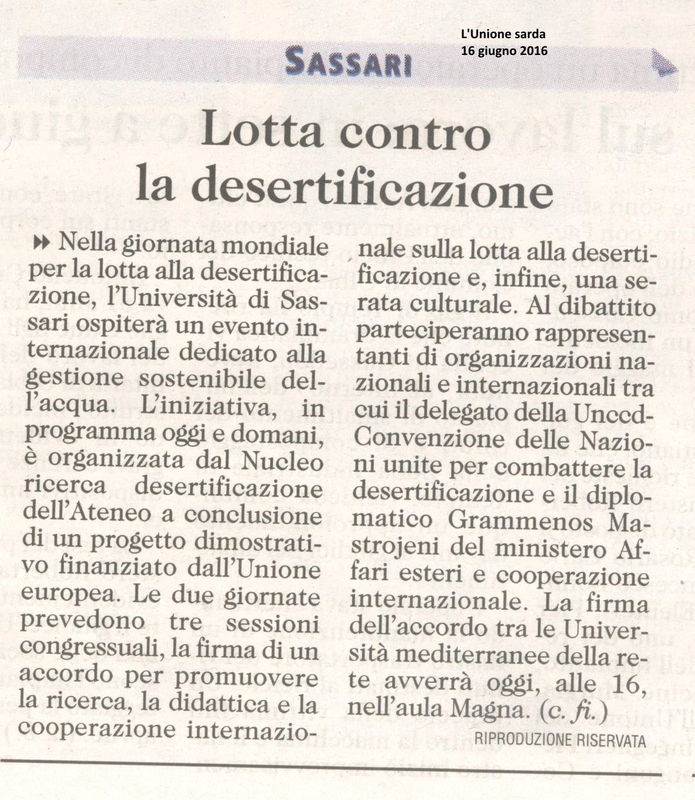 The Desertification Research Centre of the University of Sassari (NRD-UNISS) on the occasion of the closure of the Wadis-Mar project (www.wadismar.eu ) and of the 2016 World Day to combat Desertification held the final Conference in Sassari, Sardinia (Italy) on June 16th, 17th, 2016. The World Day to combat Desertification was celebrated through a two-day event, which focused on the results achieved by the project and discussions on the 6th Sustainable Development Goals "Ensure availability and sustainable management of water and sanitation for all" and its related targets and will include various cultural events on desertification and water issues. The conference saw the participation of more than 100 experts on water and agricultural issues, high-level authorities and chancellors of Universities from different Mediterranean countries, water and agricultural management Organizations and funding Institutions. In particular the event welcomed eminent scientific personalities such as prof. Andrew Manning (U.S. Geological Survey, Denver, Colorado), prof. Dirk Raes (KU Leuven, Belgium), prof. Giuseppe Scarascia Mugnozza (University of Tuscia, Italy), prof. Giovanni Barrocu (University of Cagliari, Italy) and prof. Rudy Rossetto (Sant’Anna School of Advanced Studies of Pisa, Italy) together with representatives of major world global organizations already engaged in desertification issues, such as Daniel Tsegai from the UN Convention to combat Desertification (UNCCD), Prof. Wail Benjelloun, President of UNIMED (Union of Universities Mediterranean), Prof. Grammenos Mastrojeni (Counsellor, Italian focal point at UNCCD). The event was structured in four phases. On 16th June the WADIS -MAR project results were presented and included in the context of integrated regional studies on water management while, in the afternoon, institutional stakeholders and experts were split for an interactive session of deep analyzes of the different perspectives related to water management issues. A parallel meeting was also organised at the Headquarter of the University of Sassari to identify common issues and possible future strategies of collaboration in the field of development cooperation projects funded by EU between the Universities of Sassari and Cagliari with Constantine (Algeria) and Tripoli (Lybia) Universities. On June 17th, a general overview of the results of the discussion of the previous day was provided together with new approaches on water management and desertification to celebrate the World Day to combat desertification. During the two days, a set of recommendations emerged to be addressed to decision-makers, farmers and educational system (schools and universities) of Europe, Africa and Middle East, with a particular significance given to the importance of scientific knowledge in support of effective investments to improve quality and availability of water resources together with the importance of interdisciplinary research.